After undergraduate studies in economics, statistics, economic history, human geography and business administration 1980-1986 at Uppsala University and graduate studies in economics 1986-1992 at Uppsala University and the London School of Economics I took my PhD at Uppsala University 1992. I have been at Stockholm University since, 1996, Professor of Economics since 2010. The period 2013-2014 I was State Secetary at the Ministry of Finance. I also hold the position as Vice Chairman of the General Board of Sveriges Riksbank since 2014. Implementation of the compendium concept with Sweave and DOCSTRIP, The R Journal 3(2), 16-21, 2011. On Fragile grounds: A replication of Are Muslim immigrants different in terms of cultural integration (together with Mahmood Arai och Jonas Karlsson), the Journal of the European Economic Association 9(5), 1002- 1011, 2011. Why do Scandinavian governments employ so many and the United States government so few?, (together with Hans Wijkander), FinanzArchiv 64, 364-379, 2008. Decentralizing public goods production, Journal of Public Economic Theory 10, 259-279, 2008.
Who takes care of the children? The quantity–quality model revisited (together with Henry Ohlsson), Journal of Population Economics 15, 455- 461, 2002. Social norms and moral hazard (together with Martin Dufwenberg), The Economic Journal 111, 506-525, 2001. Post mortem reputation, compensatory gifts and equal bequests (together with Henry Ohlsson), Economics Letters 68, 165–171, 2000. Wages, taxes and publicly provided day care (together with Henry Ohlsson), Journal of Population Economics 11, 185–204, 1998. Dynamic income taxation, redistribution, and the ratchet effect, (together with Mats Dillén), Journal of Public Economics 59, 69-93, 1996. The optimal two–bracket linear income tax, (together with Joel Slemrod, Shlomo Yitzhaki och Joram Mayshar), Journal of Public Economics 53, 269–290, 1994. Efficient taxation under wage rate uncertainty, Public Finance/Finances Publiques 47, 248–256, 1992. Professor of economics, (on leave 2013-2015), Stockholm University 2015-. State secretary for taxes, customs, international financial institutions, OECD and the Royal Court, Ministry of Finance 2013-2014. Professor of economics, Stockholm University 2010-2013. Associate professor of economics, Stockholm University 1996-2010. Research secretary and head of institution, Nordic Research Council 1994-1996. Political advisor and head of coordination of economic issues, Prime Minister’s Office 1992-1994. Editorial journalist, Svenska Dagbladet, 1987. Vice chairman, General Council, Sveriges Riksbank 2014-. Alternate governor for Sweden, International Monetary Fund (IMF) 2013-2014. Alternate governor for Sweden, European Bank of Reconstruction and Development (EBRD) 2013-2014. Ministry of Finance delegate to Working Party 3 for the Promotion of Better International Payments Equilibrium (WP3), OECD 2013-2014. Member of the advisory council, Skatteverket (National Tax Authority) 2011-2013. Board member, Faculty of Social Sciences, Stockholm University 2009-2012. Board member, Stockholm University Library, Stockholm University 2008-2012. Deputy head, Department of Economics, Stockholm Universty 2007-2010. Director of first and second cycle studies, Department of Economics, Stockholm University 2001-2007. Board member, Finanspolitiska forskningsinstitutet (Fiscal policy research institute) 1999-2006. Director of the graduate programme, Department of Economics, Stockholm University 1989-1999. 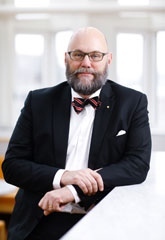 Board member, Department of Economics, Stockholm University 1997-2011, 2018-. Board member, Nordic Doctoral Programme in Economics 1994-1997. Lieutenant in the Reserve 1981–1987 and Captain in the Reserve 1987-1997, Livgrenarjärregementet I4/Fo 41.